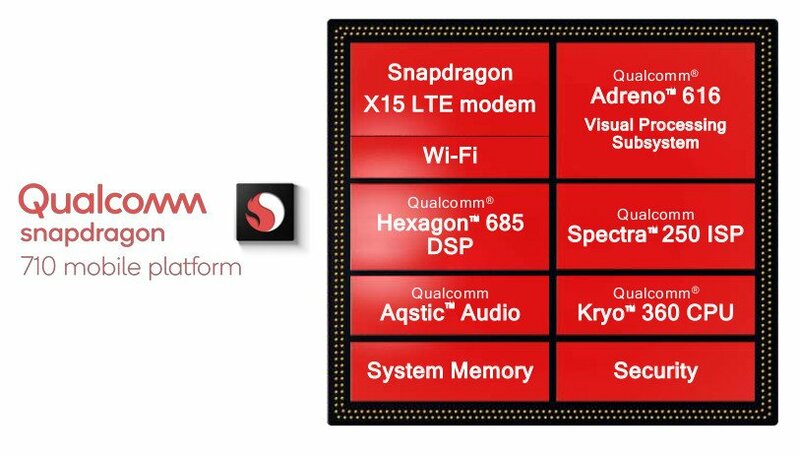 Qualcomm has introduced the new Qualcomm Snapdragon 710 Mobile Platform, built on 10nm process technology. The Snapdragon 710 is designed with highly efficient architectures for artificial intelligence, featuring a multi-core AI Engine and neural network processing capabilities. The Snapdragon 710 is the first mobile platform in the new 700-tier portfolio, high-tier mobile experiences by bringing select premium-tier features to a broader audience. AI: The new platform transforms the smartphone into a customized experience for users across camera and voice, powered by a multi-core AI Engine, delivering up to 2X overall performance improvements in AI applications, as compared to Snapdragon 660. Utilizing AI capabilities, the Snapdragon 710 makes it virtually effortless to capture and share contextually-aware photos and videos and personalize voice and speech patterns for more natural interactions. 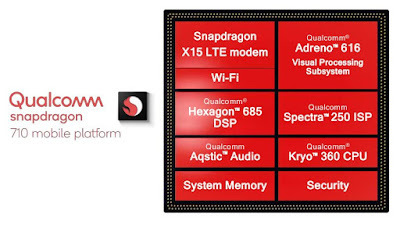 Through heterogeneous computing, the Snapdragon 710 Mobile Platform's newly enhanced architectures, including the Qualcomm® Hexagon™ DSP, Qualcomm® Adreno™ Visual Processing subsystem and Qualcomm® Kryo™ CPU, are engineered to work harmoniously to run on-device AI applications quickly, intuitively and efficiently. Capture: The new Qualcomm Spectra™ 250 ISP supports enhancements in capturing professional-grade quality photos and videos with superior low light photography, noise reduction, fast autofocus, image stabilization, smooth zoom and real-time bokeh effects. The Qualcomm Spectra 250 ISP is designed to deliver super resolutions with up to 32MP single ISP and 20MP dual ISP. Additionally, the AI Engine in the Snapdragon 710 supports smooth, speedy video style transfer, deep portrait modes and Face ID / Unlock with active depth sensing. Connectivity: The Snapdragon 710 features the new Snapdragon X15 LTE modem, a Category 15 LTE modem that supports up to 800 Mbps download speeds. It brings some of the most advanced 4G LTE technologies to the 700-tier, including 4x4 MIMO technologymfor up to 70% faster download speeds in weak signal conditions. Snapdragon 710 also offers an advanced suite of wireless technologies including cutting edge Wi-Fi features, Bluetooth 5, Qualcomm® Broadcast Audio and Qualcomm TrueWireless™ Stereo Plus to support wire-free listening experiences without wires between the left and right earbuds whilst delivering an enhanced user experience, including call voice in both ears, lower latency and longer battery life in the headset. Performance and Battery: The platform's new architectures are engineered to deliver superior power efficiency, long-lasting battery life and an overall enhanced user experience. Due to enhancements to the Adreno 616 Visual Processing Subsystem architecture, Snapdragon 710-based devices can expect to see up to 40% reduction in power consumption for both gaming and 4K HDR video playback, as well as a 20% reduction in power consumption when streaming video, when compared to Snapdragon 660. Additionally, the new Kryo 360 architecture, built on ARM® Cortex™ technology, is optimized to support up to a 20% overall uplift in performance, 25% faster web browsing and 15% faster app launch times, compared to the Snapdragon 660. Snapdragon 710 Mobile Platform is available today and is expected to be found in consumer devices in the second quarter of 2018.